WASHINGTON (CNN) -- Pharmaceutical giant Pfizer has agreed to pay a record $2.3 billion settlement to resolve criminal and civil liability for illegally promoting certain pharmaceuticals, the Justice Department announced Wednesday. Pfizer pays record fine to avoid prosecution for illegally promoting certain drugs. Officials from the Justice Department and the Department of Health and Human Services said the world's largest drug company promoted four drugs for use on certain ailments or at dosages that were not approved by the Food and Drug Administration. One of those drugs was the anti-inflammatory medication Bextra, which Pfizer pulled off the market in 2005 after it was linked to increasing the risk of heart attacks and strokes. "Pfizer promoted the sale of Bextra for several uses and dosages that the FDA specifically declined to approve due to safety concerns," the Justice Department said in a news release. A Pfizer subsidiary, Pharmacia & Upjohn Company, agreed to plead guilty to a felony violation of the Food, Drug and Cosmetic Act for "misbranding Bextra with the intent to defraud or mislead." The settlement announcement said Pfizer also illegally promoted the anti-psychotic drug Geodon, the antibiotic Zyvox and the anti-epilepsy drug Lyrica. Associate Attorney General Tom Perrelli told reporters that recommending drugs for uses not approved by the Food and Drug Administration creates a situation where "public health may be at risk." "There can be a real danger for patients when medical providers are not provided with accurate and full disclosure concerning a drug's risks and benefits," he said. The Justice Department said Pfizer sales people created sham requests from physicians asking for information about unapproved uses of certain drugs. The information was then mailed to doctors. 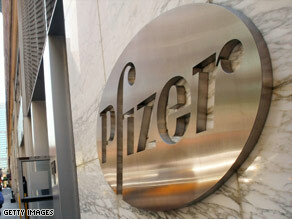 Officials said Pfizer also entertained doctors at resorts and encouraged them to prescribe its drugs. The Justice Department also said the pharmaceutical giant provided kickbacks to health-care providers to encourage them to prescribe other drugs, including Lipitor, Viagra and Zoloft. Health and Human Services Secretary Kathleen Sebelius said the settlement is historic not only because of the high financial penalty to Pfizer but also because the company will be subject to "the most comprehensive corporate integrity agreement that a drug company has ever signed in the United States." The terms call for Pfizer to conduct yearly audits and then certify it is in compliance with laws. They also require the company to create a way for doctors to report questionable behavior by Pfizer sales people, and say the company will post information on its Web site about payments and gifts to doctors. Pfizer issued a statement saying, in part, "We regret certain actions taken in the past, but are proud of the action we've taken to strengthen our internal controls." The Justice Department said the investigation and settlement would not have been possible without the assistance of whistle-blowers who worked at Pfizer. The settlement includes a provision for six of those whistle-blowers to split more than $100 million dollars. Gosh, how I love to see these guys have to pay ! Thanks, Rosemary. * Largest Medicare fraud fine ever: "Top aides in the Obama administration announced a $2.3 billion settlement on Wednesday with the pharmaceutical giant Pfizer Inc. over the company's illegal promotion of its now-withdrawn painkiller, Bextra." Makes my heart feel good! Well, OK then!! Bout time, can we start seeing some payback with Monsanto soon? companies at doctors offices. They are there to try and get the doctors in their "hip" pocket. I have noticed my physicians will not see them. That means usually my PCP for instance may not have "free samples" to give out, but believe me those "free samples" cost us somewhere... this story is a good example of that. UH OH! Watch out for a big drug increase in drug prices! Also, that's just one drug company! What about all the rest?????? LISTEN JUST WHAT DRUG IS GOOD. . . . WHEN YOU READ THE BROCHURES IN THEIR PKGS. FOR ALL OF THEM IT MIGHT JUST AS WELL BE ON ALL THE DRUGS . THEY ARE ALL THE SAME.I DO NOT LIKE TO TAKE NEW DRUGS. SEEMS WHEN i DO THEY TEND TO DO MORE HARM THEN HELP.YET SOME YOU TAKE FOR YEARS AND THERE IS NO PROBLEM. LACK OF PROPER TESTING. WHAT ELSE?IT IS LIKE THE FOOD INDUSTRY. EVERYTIME YOU TURN AROUND SOMEONE IS GETTING POISONED FROM FOOD. . TESTING FOLKS THEY CAN FIND ONE MAD COW BUT CAN THEY FIND BAD FOOD BEFORE IT GOES OUT ? NO. IT SEEMS LIKE THE MEASUREMENT RULE APPLYS.MEASURE TWICE ,CUT ONCE. WELL TEST TWICE,ONCE MORE FOR GOOD MEASURE.NOT TO MENTION WE PROBABLY HAVE MORE CZARS THEN FOOD AND DRUG INSPECTORS ! CONSIDERING THE TONS OF FOOD AND RX THAT ARE SHIPPED. IT IS CALLED "SAVE A BUCK CATASTROPHY"AT OUR EXPENSE. i wish they had said more about the Lyrica in this article, since I have recently started taking it.